Fiona sets out on a journey to find her mother and unlock her selkie magic at last in the thrilling fourth novel of The Hidden World of Changers series! When Fiona’s father finds out that Fiona is a Changer, he reveals a long-kept secret: Fiona’s mother is alive, and a selkie Changer just like her. 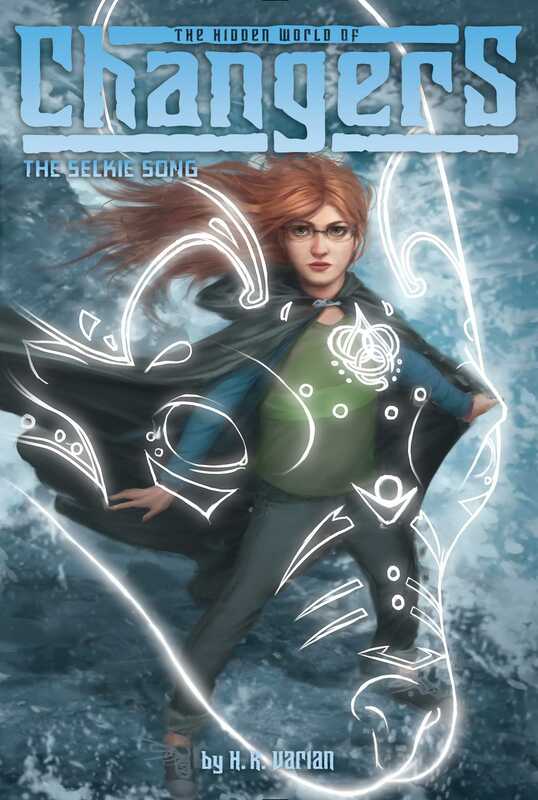 Determined to reunite her family and unlock her own selkie powers, Fiona heads to the ocean to begin the search, but is she really ready to take such a big step? And how easy will it be to find her mother, when she’s spent so many years in the wild sea? Back on land, trouble is brewing: Auden Ironbound is once again closing in on Willow Cove, this time with a new army of Changers and warlocks. At first Mack thinks the group can handle Auden on their own, but the magic that saved them last time isn’t working. They need a plan…they need Fiona. Can Fiona find her mother and save her friends before it’s too late? Fiona felt as though the world was suddenly very far away. The sound of the ocean outside her father’s window disappeared, and everything went quiet as the truth hurtled through Fiona’s mind. Then came the questions, hundreds of them, far too many for Fiona to process at once. She opened her mouth, but before she could speak, Dad placed his hand on her arm. “I’m going to make some tea,” he said. And then, just like that, Fiona was all alone. More alone than she’d been in weeks, actually; it didn’t escape her notice that Dad had taken the selkie cloak with him. What if he never gives it back? Then Fiona shook her head. Don’t think like that, she scolded herself. Fiona’s gaze drifted to the stack of photos that Dad had been looking at when she’d burst into the room. They were everywhere: the bureau, the bedspread, the floor. Fiona knelt down to pick them up. There was Mom, reading a book to baby Fiona; there was Mom, laughing as Dad fed her a bite of cake at their wedding; there was Mom, sitting on Broad Rock, staring wistfully at the ocean. That photo was enough to make Fiona sit down hard on the edge of the bed. Broad Rock was Fiona’s favorite place to go when she wanted to be alone; it had been for as long as she could remember. How many times had Fiona sat there, just like Mom, staring out at the ocean with a longing that could never be put into words? This is so much bigger than I ever imagined, Fiona realized. All the wondering and worrying that had consumed her since she first discovered her selkie cloak didn’t even begin to scratch the surface. Fiona stood up abruptly and neatly stacked the rest of the photos in an old shoebox. She had questions—so many questions! Now it was time to get some answers. In the kitchen Dad was sitting at the table, waiting for her. His smile was crooked, as though he couldn’t quite manage it, but was trying as hard as he could. Like he always has, Fiona thought suddenly, thinking back on all the years that Dad had been like a father and a mother to her. “Just how you like it,” Dad said as he pushed a blue mug across the table. Fiona took a small sip. The tea had plenty of sugar and rich cream, and the warm comfort of it was exactly what she needed. Fiona opened her mouth, then closed it, then opened it again. “I don’t even know where to begin,” she finally said. Dad rummaged through the photos; when he found the one he was looking for, his whole face lit up. “Your mother and I met at the New Brighton Gaelic Traditions Festival,” he said as he handed the photo to Fiona. Fiona stared at the picture, which showed Mom standing at a microphone. Her red hair gleamed brightly in the sun from beneath a crown of blue wildflowers. “I was still in graduate school back then,” Dad continued. “Not many people cared about ancient Gaelic storytelling, but I was determined to change that. I’d started a small journal about local artists who celebrated world cultures. It was about as popular as my field of study—which is to say, not very popular at all.” Dad chuckled at the memory. Fiona hid her smile; Dad was a professor, and sometimes it was all too easy for his logical side to take over. “And Mom changed your mind?” she asked. “It was love at first sight,” Dad confessed, a rueful smile on his face. “Amazingly, yes,” Dad said. “It’s as hard for me to believe now as it was then. The moment Leana finished her story, our eyes met, and that was it. We were inseparable.” He held out another photo of them walking on the beach, arm in arm. “It sounds like a fairy tale,” Fiona said. A feeling of dread crept over Fiona; she took another sip of her tea. “What happened?” she said. If she hadn’t longed for answers for such a long time, she might never have had the courage to ask. “What was wrong with her?” Fiona asked. “So it was my fault she left?” Fiona asked, her voice barely louder than a whisper. All Fiona could do was nod. “Were you angry with her for keeping so many secrets?” Fiona asked. Fiona let herself smile, but only for a moment; her next question was already on the tip of her tongue. “How come it didn’t last?” she asked. Disappeared—not died, Fiona thought. But she didn’t say a word. “What was it?” Fiona asked breathlessly. Fiona clutched her mug of tea, but it had grown cold. Of course there had been a choice to make, and it was very clear, wasn’t it, how Mom had chosen? But Fiona had to hear it. She had to hear Dad say it. “But she didn’t stay,” Fiona said. “And you never saw her again?” asked Fiona. “But . . . if you knew she was out there, if you knew she was coming around, why did you tell me she died?” asked Fiona. “Because she asked me to,” Dad replied. “Leana said that when you were old enough, she would explain everything. Perhaps I should’ve waited for her to come back, to let her tell you all this. But to be honest, I feel like I waited too long to speak up. It wouldn’t be right to keep the truth from you any longer. With that, Dad placed the selkie cloak in Fiona’s lap. Fiona buried her face in her dad’s shoulder. A strange mix of emotions was fighting inside her. She cried for her brokenhearted father, who had worked so hard to raise her all these lonely years. She cried thinking of the things her mother had missed, moments that the two of them would never get back. But more than anything, Fiona cried from joy, from relief, from glee—Mom was alive! Every time Fiona had longed to see her, Mom had been just out in the ocean, keeping a watchful eye. The questions that had consumed Fiona no longer seemed so impossible to answer. In fact, the answers she needed now seemed closer than ever. The shift in Fiona’s emotions was sudden. She’s been close this whole time, she thought. What—what was she waiting for? Didn’t she know that Fiona missed her? Didn’t she know that Fiona needed her? Didn’t she know that Fiona was twelve years old now, and facing all the marvelous, terrifying realities of being a Changer? Fiona forced herself to stop crying and took a deep, shuddering breath. She looked up, over Dad’s shoulder, toward the kitchen window, where she could see the ocean glittering under the morning sun. There was still one question, Fiona realized, that was troubling her more than all the others. Mom, she thought. Why did you leave us?